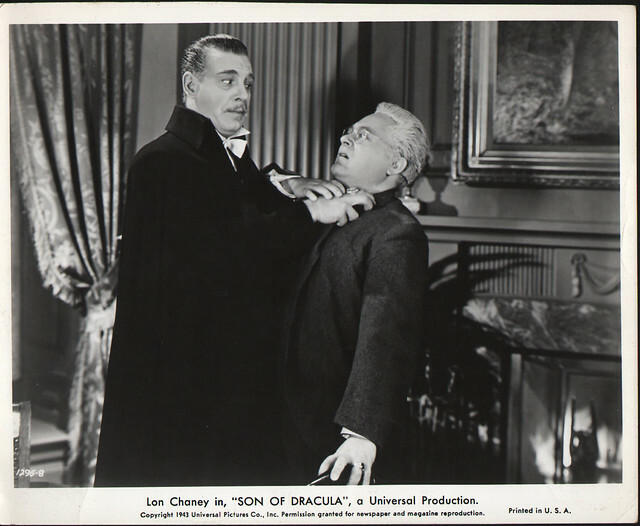 And with this photo of Lon Chaney Jr. portraying the Count, it’s my sad duty to tell you that this will be the last posting for this blog, as my archive of photos has finally run dry. Over the past 1,223 posts, from December 1, 2008 to the present, it’s been fun sharing all these Dracula-related photos and scans with you, but all good things must come to an end. Of course, I’m still keeping my eyes open for photos or scans of Drac stuff that hasn’t been seen here before, and that stuff will no doubt show up in future posts on my main blog, Random Acts of Geekery. And as with my other retired blogs, Dracula’s Crypt of Collectibles will not be deleted, the full archives will always be here for your (and other Count enthusiasts) to peruse at your leisure! Thank you all, and good evening!